A person's 90th birthday is cause for a special and thoughtful celebration. 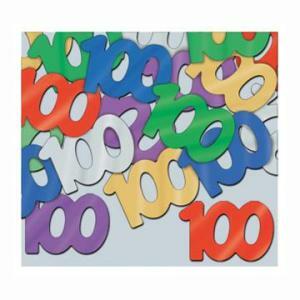 This is a guide about 90th birthday party ideas. My mom's 90th birthday is next month. She is no ordinary 90 year old! For her 80th, she went sky diving! She is in excellent health, so we need ideas for something memorable! Consider the year she was born and do a timeline of her life with pics and things that she would to reminisce over, all the achievements she surpassed in her life and things that happened that year of her life such as: Mom the day you were born X happened on you birthday, when you were 3 this happened when you were 9 this happened you did this when you were 10 and did you know; somethings that others would never have known would be great. I wish your mother many years to come- maybe she will be in the hall of ages. Your state should have one and you should see what the oldest person in your state lived to be. Your mother sure does have great kid(s) if they are wise to ask for ideas! Hope the party is kickin! How about a balloon ride? Or a motorcycle ride? Someone in my family is turning 90 in June. What should I do for her? She really does have a sweet tooth, and she's Italian so you could only imagine how much she loves food. We're struggling to find something good to do for her because we're on a budget, but she is a very exciting lady! Please help us out with some fun/cute ideas for this great new milestone. I would try to make some of the desserts she grew up with and loved. I would also decorate the room with as many pictures of her taken throughout her life as possible. I had 2 grandmothers who passed away at 96. Neither one of them liked any of those things at all. They were both so different. Both of them were very active and had no issues of getting around or anything. One of the best surprises we did for the both of them was to contact their life long friend who lived in another state and ask them if it was possible to come out. We had a nice dinner, the table was set for the holidays, and then the doorbell rang and the surprise came in. It was the happiest I had seen the both of them in years. If she has friends she has seen in years and always talks about them, see if you can get them to come and give her a surprise. Just make a nice dinner and have cake or her favorite dessert. I need ideas for my mother's 90th birthday party. She has always been a strong woman, and a custom tailor for the stars of yesteryear. That is so awesome that she is turning 90! And since she's the Star of the Show and had mingled with the stars of yesterday, I say throwing a Hollywood glam party is in order! Start out by rolling out the red carpet. Have dangling stars in the party area. Have guests each write their name on a star to pin up (can find craft spray glitter). Have balloons with craft spray glitter for the centerpieces on tables. Use 3 at varying heights, weight them down in small party bag with tissue paper. You can add feather plumes to the bags for more embellishment. Have "Swag Bags" for the guests' gifts with a memento in there for them. (Or if not doing that: have 1 nice Swag Bag for your Mom filled with special things). Have posters up of former Hollywood stars or get print outs and frame in card stock to hang up. Have props like a Director's chair, clapboards (you can make yourself using card stock ) for name cards on table, have a megaphone. On the food table: label the foods Hollywood style: Have mirrors to reflect light with candles on them, dress the table in elegant style. You can even have platters sit atop boxes/large cans placed underneath the tablecloth if it's buffet, bunch the material around the container (it's hidden), string little lights around the platters, add decorations like confetti. "Best App (short for appetizer) in a Leading Role"
"Best Design for a Mocktail"; serve sparkling drinks in fancy glasses with garnishes, or serve an actual cocktail, whichever way you're going! "Best App for All Audiences"
"Best Dressed", I'll give you link to make tuxedo-style chocolate strawberries: can also make dresses, just use a toothpick to add a dotted necklace for the ladies' version. Pour into 1-oz. plastic cups; top with wafer crumbs. Serve immediately. This is a great game to start the party out! Before the party, write down a bunch of actor and actresses names on a piece of paper. Cut each out. Once all the guests are settled, tape a name to each persons back. The guests need to ask only yes/no questions to try to find out who is taped to their back. For a younger group of guests, pick out names of characters from children's movies that they would most likely know. For instance, Woody or Buzz from Toy Story, Flick from Bugs Life, Beethoven (the dog), etc.Or do a "grown up version", with more familiar movie star names! Have Paparazzi start taking pics as each guest arrives and shout excitedly! Send pics to guests after the party. You can have photo frames for guests to decorate themselves with supplies or hand them out as gifts in their "Swag Bag" (treat bag). Have movies playing in the background and even old Show tunes. Best Comedic Actor or Actress (your funny friends who are always cracking jokes, etc.) just think of more if you need them and tailor them to your specific crowd. I wouldn't have the space overly cluttered, but instead very eye appealing where it captures your attention, if you have a chandelier, that's good, otherwise don't use overhead lights, can set spotlights up behind furniture or plants. I need ideas for my mother's 90th birthday party. Looks like your Mom was born in 1919, my Dad's birth year [he's gone]. So she was 10 in 1929, when the market crashed, and spent her teens in the Great Depression, and was in her prime early 20s during WW2. She saw all the wars and went from Ice box years, radio shows instead of TV, Sputnik (October 17th, 1957 I think) and now the internet. There are a lot of pix out there of all those things, events, I'd do a great big collage on one or two pieces of posterboard, and print pix from the internet. Lana Turner, Leslie Howard, all the Barrymores, Jean Arthur, Jimmy Stewart, Joan Crawford, Joan Blondell, just look up stars of the 30s and 40s. What fun. Wish her happy birthday from all of us. 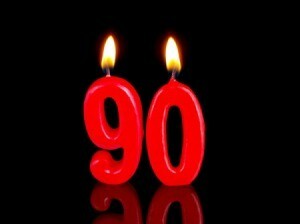 I need ideas for a 90th birthday party. For my father's 90th birthday we had everyone call a toll-free number and record their stories and memories. We had about 60 people call-in from all over the country. We played the CD with all the recordings at the 90th birthday party. We did this for my grandmother's 90th. And it could cost as little as nothing to what you feel is right. We made a donation. But we contacted the local high school and asked if their marching band would play and march down the street to her house and come into the backyard and play a couple songs for her. Bands are always up lifting and fun cause everyone loves a parade, right? And the high school band is always looking to practice. It was the most beautiful day in August. I am looking for 90 year old man's birthday party ideas centerpieces, crafts, etc. 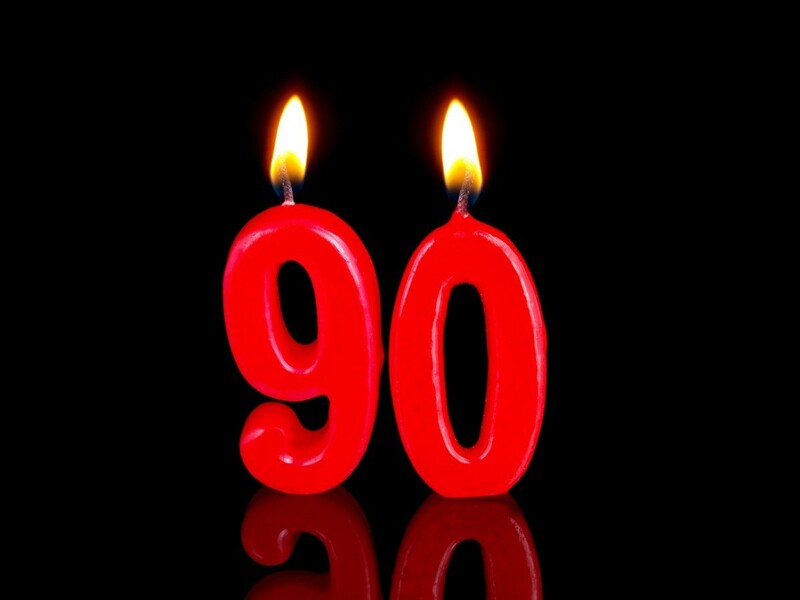 My mother's 90th birthday is coming up in Feb. She has Alzheimer's and is in a nursing home, which can be a depressing place to have a party, but I am going to make it as festive as I can with balloons, streamers, etc. I invited her nieces and nephews and some people from her old neighborhood. I made a poster board with some pictures of her as a young girl and young woman. I think everyone will be shocked when they see what a beautiful woman she once was. Any ideas on nice centerpieces for a 90th birthday party that will take place in the summertime.